Are there times when you need an instant way to destroy documents with sensitive information? Are you a university or college head looking for ways to secure sensitive information before discarding them? Perhaps you are an educational office owner looking for a solution to destroying sensitive documents without throwing them in the bin. We have the solution for you - shredders, disintegrators, and Degaussers. Unlike the usual shredding solutions, our devices are approved disintegrators that destroy all kinds of classified media and documents, helping you keep things top secret. They are not just effective in destroying paperwork, but a variety of them even destroy items like CDs, DVDs, cartridges, plastic cards, ID cards, memory sticks, magnetic media, optical items, and microfilms. Depending on your specific needs, you can select which shredding solutions work best for you. You may want to know what the difference between these three types of solutions is, so let us look at them closely. A shredder is a machine that destroys things by shredding them into bits. They are usually electrically operated and easy to handle. Usually, businesses, educational institutions, and government or private organizations use these devices to destroy confidential, private, and sensitive documents. The first ever known shredder created was by Abbot Augustus Low, in 1909. However, this invention never became famous until 1935, when Adolf Ehinger's paper shredder got attention in Germany. He supposedly used it to shred documents with anti-Nazi propaganda to avoid inquiries by the authorities. Of course, the shredders we have today are very different from those early ones. 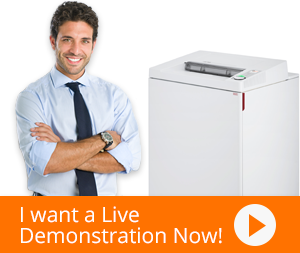 Now, shredders are very compact, portable, noiseless, and highly sophisticated machines. This machine crushes rods into fine or coarse bits. They pulverize brittle objects with now abrasiveness and mix them well. Disintegrators comprise of two contrarotating rotors, which are on separate coaxial shafts located inside a housing section. The two to four cylindrical pins work like beaters to crush the materials into coarse bits. Ideally, disintegrators are for crushing minerals like peat, coal, sulfur, and gypsum. Today, there are all kinds of disintegrators available in the market. Each design comes with unique features and capabilities. You can use disintegrators to destroy virtually any kind of device that bears sensitive information. This includes things like cassettes, hard drives, USBs, and others. These are machines, which erase data on a tape or hard drive by demagnetizing them. Degaussers help destroy diskettes, hard drives, reels, cartridges, and cassettes. This method of destroying top-secret information stored on these devices proves to be very effective. Using degaussers offers a guarantee and a convenient way of getting rid of sensitive information. The degausser erases information by generating a very powerful magnetic field, which erases all the magnetic property of these external storage devices. There are many models of degaussers on the market now. You can choose one with higher or lower magnetic field strength and prices vary likewise. To wrap things up, it is important to mention that in this technologically advanced world, it is important to use these devices to protect top-secret information. Whether it is a school, university, or public education institution, a shredder, disintegrator and a degausser is a must-have.